The instruments in the 'consort of six' were carefully selected to give a balanced and beautiful sound. It is hard now to realise how revolutionary this was. 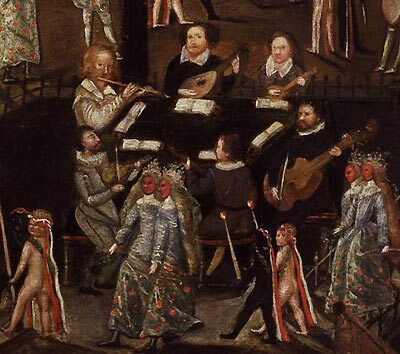 Whilst various types of instruments must surely have played together in an improvised way, there is no evidence of any formally written-down music for a mixed consort, anywhere in Europe, before the development of the Elizabethan consort of six. It can be said that this consort music represents the very start of 'orchestration' as we know it today. The supreme master was the composer, Richard Alison. More than any other, he saw the possibilities for contrasting, echoing, or blending the very different textures from the individual instruments to achieve a totally new sound world. In the consort, the top line, most usually the tune of a dance or a song, was given to the treble viol (or violin). This was supported by the bass viol. The flute (or recorder) played a second line between the two bowed string instruments. To provide a steady rhythm were two wire-strung members of the lute family - the cittern (already a popular instrument) and, below it in pitch, the bandora (possibly invented to meet the needs of the consort). The wire strings of the cittern and bandora created a different sound texture to the gut strings of the lute, and their ringing resonance is part of the charm of the consort. The lute, the most widespread and popular of the courtly instruments, provided a multifaceted role – sometimes supporting the bass, sometimes the rhythm section, sometimes even playing the tune, but mostly decorating repeated sections with fast-moving scales and ornamentation, called divisions. This unique and precise grouping of bowed strings, plucked strings and woodwind started as courtly entertainment for royalty, noble families or the just plain rich, but the popularity of its special sound led to its adoption as the standard house-band in some theatres. Four collections of music for this Consort have survived, although none is complete. There were two published collections, by Thomas Morley (1599, reprinted in 1611) and Philip Rosseter (1609), together with two private manuscript collections from the household of Sir Francis Walsingham (Queen Elizabeth’s Secretary of State) and Mathew Holmes from Oxford University. The first surviving reference to this music is in the play, Jocasta, in 1566. From the famous visit of Queen Elizabeth I to Kenilworth Castle in 1575, there is a surviving description of music played by "six several instruments, incomparably harmonious". There are two further references to the Queen hearing a "consort" play - in Norwich, in 1578, during one of her progresses, and in 1591, at Elvetham. The latter gives an exact description of the entertainment including "after this speech the Fairy Queene and her maides danced about the garden singing a song of six parts, with the music of an exquisite consort, wherein was the lute, bandora, bass viol, cittern, treble viol and flute". There is only one surviving painting of such a consort, and it is contained within the memorial painting of the life of Sir Henry Unton, now in the National Portrait Gallery. This interesting painting contains all aspects of Sir Henry’s life (and death). There is a depiction of a consort playing for a masque, just below the dining table on the lower right side of the picture. The image above is that small section from the full painting. A copy of the full painting can be seen on the contact page. Unfortunately, because the music was written in six parts, and in six separate books, none of it has survived intact. It wasn’t normal in those days to provide a complete score of the music. What now survives varies between 1 and 4 books from each set, distributed in various libraries in the UK and in the USA. The flute (recorder) and cittern have fared the best with 5 surviving part books, with the lute and bandora faring the worst with just 1. But miraculously, some of the same pieces of music appear in more than one collection, and so there is a core of about 20 pieces where we do have all six parts. The missing parts for many of the other pieces can be reconstructed from other sources, such as lute duets or songs, together with some new parts written in the style of the surviving music - a daunting task, and not yet complete. In recent years, odd bits of these part books have turned up in old libraries, where this out-of-fashion, and in some cases unintelligible, music was used to bind and repair other old books in previous centuries. The instruments that comprise the consort of six are clearly defined, the only variables being the substitution of a violin for a treble viol, or a recorder for the flute. At first sight, the viol looks similar to the violin and 'cello family of instruments, but there are quite a few significant differences. The viol has six strings compared with the violin's four, and has frets on the fingerboard, like a lute or guitar, whereas the violin does not. The viol is played with a very different bowing technique, and the sound produced is much softer. The viol is an older instrument and shares its history with the lute. In 1523, a treatise by Judenkűnig gave one set of instructions for playing both the viol and the lute. In Spain, the word 'vihuela' was used for both viols and a lute-like instrument – one was bowed and the other plucked. The viol came to England from Continental courts in Tudor times, and quickly became a popular instrument, particularly for playing in all-viol consorts. The term 'a chest of viols' meant a full set of consort viols of different sizes. Of the 4 principal sizes available, Lachrimae uses the treble and the bass viols. The viol was eventually superseded by the much louder, brasher violin in the 17th Century, although the bass viol was in use as a continuo and a solo instrument well into the 18th Century. Most of the surviving consort books require a flute for the woodwind instrument, but the Holmes manuscript specifies a recorder. The instruments are interchangeable, although different sizes of recorder are needed to match the wider range of a flute. The instrument came originally from Italy and was popular in the Tudor courts. Like the viol, the recorder came in many different sizes, and often played in recorder-only consorts. The recorders used by Lachrimae include the bass, tenor, alto, descant and sopranino. The lute was the pre-eminent courtly instrument of Tudor times. It was used for solo music, for accompanying songs or in consorts with more lutes, or other instruments. Originally Chinese, the instrument came into Europe via the Arabic countries, where the 'ud' is still played – the name 'lute' may be derived from the Arabic 'al ud'. Although an ancient instrument, the development of polyphony in Renaissance Italy and the discovery that moving harmonies could be played on the lute by plucking the strings with the fingers, rather than with a plectrum, led to the incredible rise in its popularity. 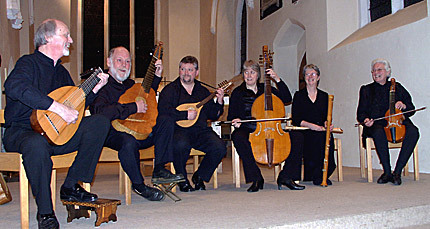 The Elizabethan lute, with its distinctive sliced-pear shape, generally had between 11 and 15 gut strings, tuned and played in pairs, apart from a single top string. This wire-strung, plucked instrument was very popular in the Renaissance, although generally considered of lower social status than the noble lute – it was the traditional barber's shop instrument. It has ancient roots in the Greek 'kithara'. It eventually became popular in courtly circles and, being plucked with a plectrum rather than fingertips, was an ideal instrument to strum song accompaniments. This instrument was invented in England in 1562 by John Rose, possibly specifically for the needs of the 'consort of six'. The first printed songs in England used the bandora for accompaniment. The composer and courtier, Anthony Holborne, wrote much music for the bandora and cittern, as well as for the lute. The instrument generally had six pairs of wire strings of a much lower pitch than the cittern.